iRobot with retroreflective markers attached to it. In eecs149lab project we set up a robot localization system using Natural Point's OptiTrack System, to localize iRobots that are used in EE149(Embedded Systems Undergraduate Course) and EE125(Introduction to Robotics). Reflective markers are attached to the robot and are localized as a rigid body by the TrackingTools software provided by NaturalPoint Inc. After localizing the rigid body transfer of the coordinates of rigid body's center of mass is done in Real Time using vrpn library. 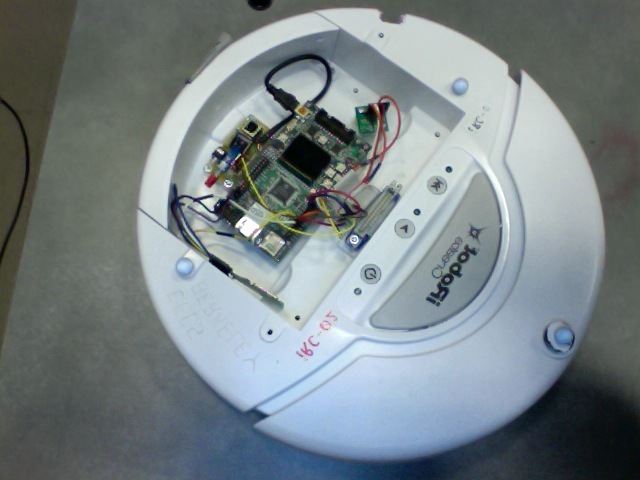 The data is transferred over sockets to the bluetooth code, and is transferred to the blueSMiRF on the iRobot using the PyBluz library. Mailing lists and discussion forums may be found under the eecs149lab link above.